Julian Charles’ objective is to increase its market presence and effectiveness as an online retailer and we set some highly ambitious targets. 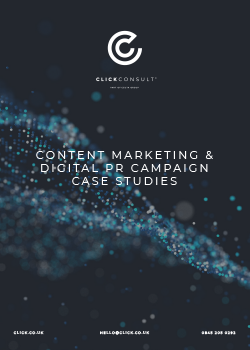 Our SEO, PPC content marketing, outreach and social media teams have been collaborating since 2014 on an integrated search marketing strategy aimed at strengthening Julian Charles’ search visibility, increasing high quality traffic volume and, ultimately, maximising revenue. Our SEO work focuses on improving the rankings of generic and long tail terms to drive traffic and therefore increased revenue to the site. In February 2017 there was a Google quality update called Phantom 5, and the following month, Google released an updated version of its ‘Search Quality Evaluator’ guidelines. 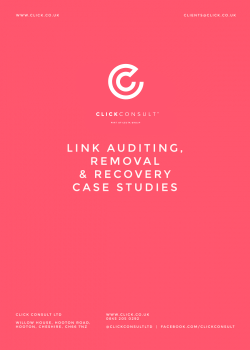 As a result of this, we analysed a selection of pages on the Julian Charles site to ensure that it was in-line with the Search Quality Guidelines, that content adequately fulfilled search engine users’ needs and communicated the expertise, authority and trustworthiness of the brand. Delivering a full keyword planning document. Creating additional content on categories pages that was unique and specific to that category, and focused on targeted keywords. Revising homepage content to increase trust levels with new visitors. Our #RenovateDecorateInspire campaign created a natural, high quality link building pattern to support SEO. 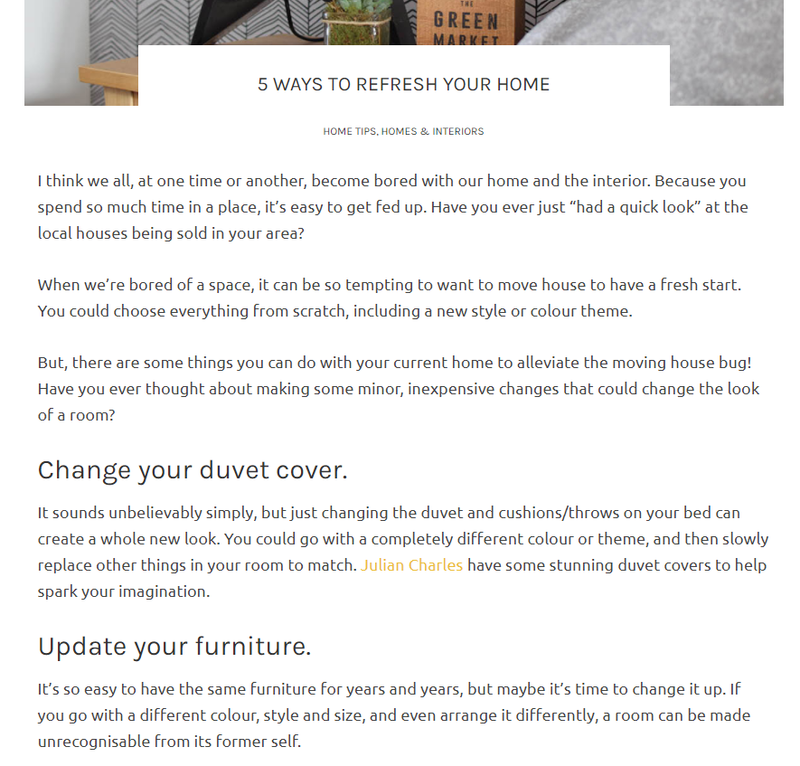 We did this by engaging relevant, influential bloggers with a 10 page eBook developed by our content and design teams, full of tips and advice on how to transform your home at a much lower cost than having to move house. The campaign content encouraged bloggers to write about small changes people could make to transform the look of a room. We also provided bloggers with fact sheets to give them some inspiration and help them write the post. Our aim was to increase awareness of the Julian Charles brand, and to support Julian Charles’ organic search presence for certain products and webpages. 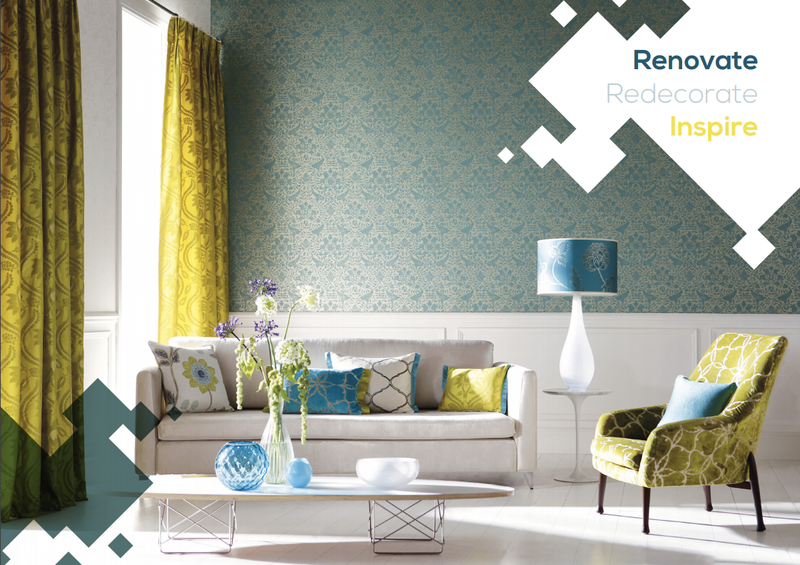 The #RenovateDecorateInspire campaign was successful in improving and maintaining ranking positions for targeted keywords, raising awareness of the Julian Charles brand across social media, and supporting SEO activity. Social engagement: 142K impressions and 57 mentions, which came from social influencer accounts with a large following of 1000-4999 followers. Julian Charles recognised that key dates throughout their calendar such as End of Season, Black Friday and Christmas offer great opportunities. We were tasked with applying the best possible promotion and campaign management throughout these periods and beyond, while still providing our continuous efforts for innovation and thought leadership. The plan was to use an array of campaign types: Search, Remarketing (Dynamic and Image Based), Display, Dynamic Search Ads and Shopping. This diversity this meant we have been able to connect with not only their current audience base, but also new and future potential convertors resulting in growth. Using our own in house projection tool, ProTRAX, we were able to take projections to the next level and find the most profitable points throughout the year in which to push additional revenue through. This non-linear model allowed us to expose the true potential throughout the year and pushed growth much further than a rigid, even split, budget would have. Competitor research allowed us to find opportunities with regards to what and where to target in order to gain market share. One example of this is that we were able to prepare for the “Crushed Velvet” rush ahead of the industry and position ourselves as market leaders during the Christmas period. Dynamic search ads are often dismissed within the industry; however we came up with a structure that allowed them to run within the account purely for research purposes. We did this using extensive negative lists, regular negative expansion and regular building into the account. It worked very well in terms of driving traffic to the account at very little cost but also due to the segmentation we applied it also helped bring in revenue and highlight huge opportunities to be added into the account. This year we tested a new system within Shopping Campaigns. Often, businesses you have a lack of control over products that can be shown for certain search terms. As a result often for generic searches products can be shown which do not perform well for these types of searches and vice versa. We wanted to gain more control and came up with the idea of segmenting the products into individual ad groups, creating our own bespoke tools that would allow this for easy upload. This allowed us to start adding negatives to products that did not perform for certain search terms and therefore allow another product to show in its place. Julian Charles offers a wide range of highly visual products so improving their online presence through shopping campaigns was highly important. We used feed optimisation (through bespoke software feedTRAX) to carefully ensure all attributes were correct and ready to be matched to users’ search queries. 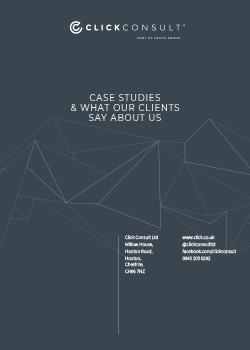 We used business data to keep the ‘local feel’ of the company. We were able to promote information within ad copy based around delivery information specifically to that user’s current location. This improved the click through rate from users as expected from any form of personalisation within an ad copy. Using advanced remarketing segmentation facilitated through Google Analytics we developed unique and highly segmented lists and applied them in numerous ways including search remarketing and display remarketing.